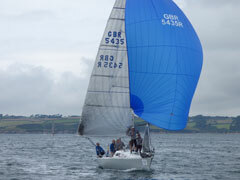 Falmouth Week ended and the preparations for the Half Ton cup went ahead with marks, ground gear, flags etc, etc to gather. 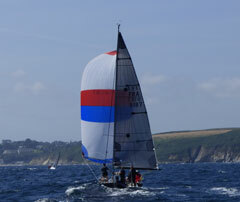 FSC also hosted a disappointing low numbers of Fowey yachts for the feeder race on Monday. 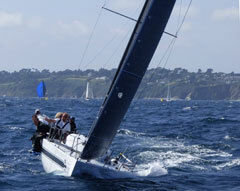 Monday dawned and the twenty competition yachts all rafted up in the Port Pendennis Pool looked a fine sight. 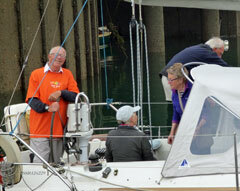 Jack Penty and Dave Owen gave briefings and advice and the fleet moved into the bay. It was a force five easterly with a manky sea state and white horses. The committee boat anchored south off Gyllingvase and the pin end Motorboat, Bold Lancer did likewise. 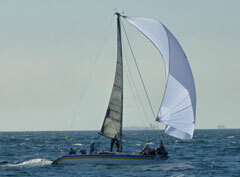 The course was set with windward mark 0.8 nm away. 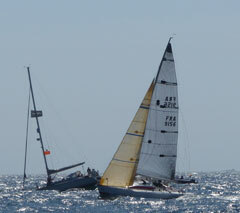 The first start, a practice race went well and the yachts all returned to the start area. Fun and games then started as the start for the championships was terminated with a general recall. Too keen and all over the line so a second start was initiated. Again Jack Penty the Race Officer called a recall. “Naughty Boys” he said over the radio and the third start had a black flag imposition. Three boats were caught this time and had to leave the racecourse. 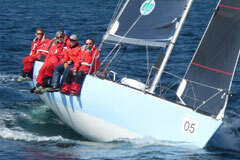 At the windward mark we watched with fascination as the fleet split evenly either side of the course axis. The yachts approached the windward mark with Swuzzlebubble Greg Peck and Miss Whiplash Paul Pullen both showing the fleet how to do it! Three rounds and Whiplash had it by a whisker. The second race saw Swuzzle take the first place and Whiplash into second. 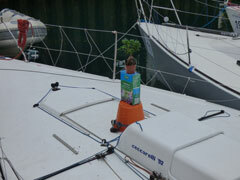 We all went back to the marina, tired and happy, looking forward to a pleasant evening. And boy it was!! The crews were brought to FSC and fed pasties and good local beer. The wind dropped off and they sat on Flushing quay looking at a wonderful sunset talking shop and socializing in idyllic surroundings. Several comments were made by visiting crews from France, Belgium, Norway and Ireland about our fantastic location and good hospitality! Tuesday dawned and they were sent on a marathon 29 mile thrash to the east in wind and waves similar to Mondays offering. Tragedy struck local yacht Per Elisa, Robbie Tregear when the Dodman seas and shifty winds sent their mast into the sea in three pieces with all sails lost during a gybe! The poor guys are now out of the running as the mast section is a one off and replacement will take time. 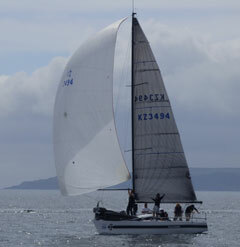 After the gruelling sail Whiplash took Swuzzlebubble by 6 seconds on corrected time. Close or what? 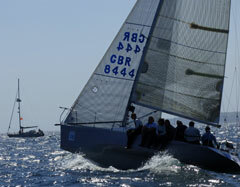 Great sailing and fantastic competition. Wednesday looms and who knows what it brings. Jack, Dave, Kaye and all the volunteers need a real pat on the back for providing some great sailing and making FSC stand out in the Port. well done everybody and long may it continue. Read more about the Cup at the blog and the website.